The Skinny: Ringo Lam's mystery/supernatural thriller delivers on all counts, delivering a suspenseful, well-acted melodrama that involves and entertains. 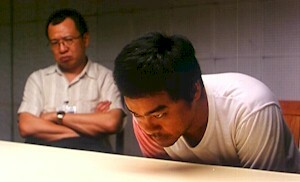 by Kozo: Ma Man-Sun (Lau Ching-Wan) is mysteriously kidnapped and Detective Pit (Tony Leung Ka-Fai) is on the case. After staking out Ma’s girlfriend Amy (Amy Kwok), they receive a call that places Ma in a haunted mansion with a notorious history. It seems that the owner of said house discovered his wife was unfaithful and decapitated her before poisoning himself and his son. If that weren’t spooky enough, Ma exits the experience a changed man. He drinks heavily, is incredibly jealous, and seems to be obsessed with holding onto his overpriced home. Could he be possessed by the murderous husband?